Construct a new interchange on I-275 at Graves Road to improve mobility and reduce congestion in the Hebron area as recommended in the Kentucky Transportation Cabinet’s Graves Road Interchange Justification Study. Include improvements to Graves Road from KY 237 (North Bend Road) to KY 20 (Petersburg Road). Install a multi-use path on Graves Road to accommodate bicycles and pedestrians. A new interchange on I-275 at Graves Road will provide alternate access to I-275 for residents, businesses and trucks in the Hebron area, thereby alleviating travel demand and congestion on KY 237. Safety will be improved by correcting geometric deficiencies on Graves Road. Added roadway capacity provided by Graves Road will accommodate future increases in traffic volumes expected from the interchange construction and future development in the Hebron area. Improvements to Graves Road and additional access to I-275 will enhance access to a TANK Park & Ride lot and provide new, potentially more efficient transit routing options. The Graves Road multi-use path will connect to the existing KY 237 path, the proposed KY 20 (Petersburg Road) path from Graves Road to KY 237, and the surrounding Boone County bicycle/pedestrian network. This recommendation is consistent with Boone County’s overall goal of improved bicycle and pedestrian connectivity and safety. Click HERE for a map of multi-use paths in Boone County. Potential historic sites on the National Register of Historic Places are located in the project area. 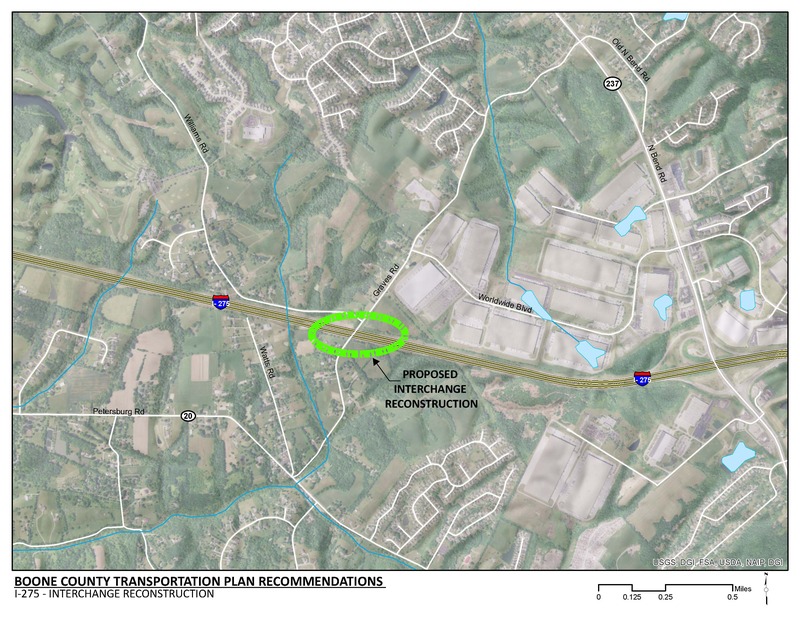 The Graves Road interchange and improvements will require additional right-of-way. KY 237 (North Bend Road) in Hebron is heavily congested. OKI’s Travel Time Index tool states that vehicles traveling on KY 237 experience a travel time delay of almost 50 percent. Additional traffic volumes are expected in the Hebron area as industrial, commercial, and residential development continues in the area. To avoid congestion at the I-275 interchange, many residents in the Thornwilde and Treetops subdivisions currently use Graves Road as an alternative route. Future 2040 land use maps show the residential and industrial expansion in the Hebron area. There are potential historic sites on the National Register of Historic Places and a fire station identified within the project area. TANK route 40x serves industrial developments in the Hebron area along World Wide Boulevard, South Park Drive, Global Way, and KY 237. There is also a TANK Park & Ride lot located at the Cardinal Way/KY 237 roundabout. The frequency of crashes along Graves Road is 80 percent higher than the statewide average for similar roadways. With no additional improvements, there is a high potential in the future for an increase in crashes as more vehicles use Graves Road. There is an existing multi-use path on KY 237 that connects residential, commercial, and industrial developments.